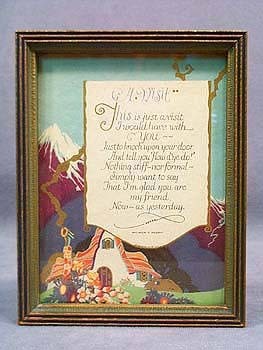 Delicately encased behind glass in a beautiful multi-surface wooden frame, Wilbur D. Nesbit's sentimental poem "A Visit" is presented with a colorful mountain chalet in the background. Appealing in its heartfelt words of friendship, this charming poem reads "This is just a visit I would have with You - - Just to knock upon your door - And tell you "How d'ye do!" 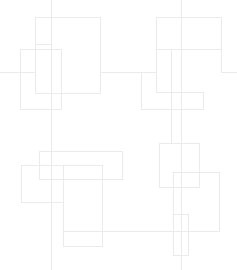 - Nothing still ~ nor formal ~ Simply want to say - That I'm glad you are my friend, Now ~ as yesterday." The unusual 5-3/4" tall and 4-1/2" wide frame is finished with a gold-green wash, and highlighted with deep blue. The marbleized tan and black paper covering the back of the frame has some tears, and a small metal fitting is attached to the back for hanging.